Our SE200 switches stand above the rest by offering you the lowest prices in the industry for an industrial grade unmanaged switch. The larger your network, the more you save. SE200 switches are plug and play, best-in-class, UL certified equipment. Their robust, IP30 rated metal enclosure is designed to stand up to challenging industrial applications while providing efficient heat dissipation. 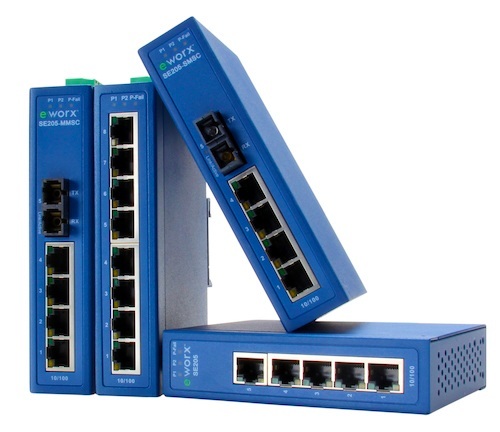 SE200 switches are available with standard 10/100Mbps speed for twisted pair ports as well as 100Mbps for the fiber optic connections in the fiber models. They provide store and forward technology, as well as MDI/MDIX auto sensing to ensure connectivity on the copper ports. Status LEDs indicate active link, speed and collision status. Power is a 12-48 VDC redundant input design and is secured with a double protection mechanism: Polarity Reverse and Overload Protection. Polarity Reverse prevents damage to the switch in the event of incorrect power wiring. Overload Protection is a resettable fuse that prevents power overloads from causing damage to the switch – when normal power is resumed the switch will restart automatically. SE200 series switches provide the features you need at a price that makes sense. Ethernet Auto Sensing, 10/100BaseTX, Duplex and MDIX.